Lately, I’ve been feeling very inspired to try some new projects and I’m very fortunate to know a talented artist and photographer who could help me make this one happen. I’m very pleased to introduce Bonnie (the knitter) and Pepper (the techie), the stars of the first CraftSanity animation. 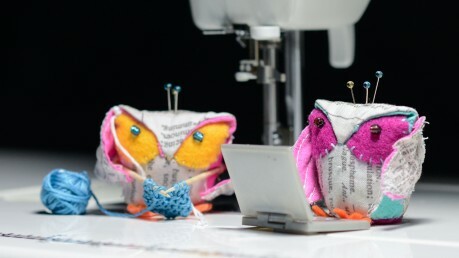 I made these owls inspired by the the book “Pretty Birds!” by Virginia Lindsay and then Jonathan Lopez brought them to life. My daughters did the voices and we all had a blast. When times get tough, get more creative. It makes everyone feel better. Bonnie and Pepper want you all to know that you can sign up for the CraftSanity newsletter here. If you like the video, please share it with a friend. Have a great day!